Generate more leads, close more sales and get better returns from your marketing. Tell readers your story and slip your message into their minds, until they realize your product and service provide relief from their pain. Who better to tell your story than a copywriter who's been a tech journalist, IT specialist and commission-only salesperson? The most profitable marketers use this method, because it consistently achieves outstanding results. Combining journalistic storytelling with direct response copywriting slips your message into your customers' minds, without them realizing they're being sold to. Demonstrating a benefit of your product? Inviting viewers to an event? Having written and edited thousands of articles, I know the formula for a great article that publishers look for. As the former editor of Securebuzz.ca, eWeek Canada and SecurIT, writer for The Computer Paper, eChannelline, ConnectIT, InfoExecutive, and many more, hundreds of thousands of sharp-eyed technology readers have scrutinized my articles. Now you can have the formula for achieving extraordinary results from every campaign. 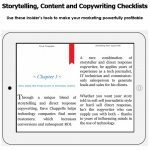 Ask for your free copy of these three checklists in one to ensure your writing is always powerful. Guaranteed to help you maximize every inch of your selling space, these checklists were developed during 18 years of creating captivating content for companies and publications.